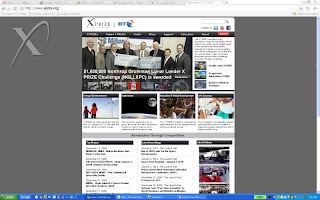 Late last night, our web production team rolled out a new design for the Foundation's main webpage, www.xprize.org. A screen capture of the new site is at right. Hopefully you'll agree that this site has a bit more, shall we say, savoir faire, than the old version. (Note for a really fun time, check out this super ancient X PRIZE Foundation website from back in the mid 90s. We couldn't even afford to capitalize the RIZE in PRIZE back then!). With any luck, this new design will give first-time visitors a more clear impression of who we are and what we do within their first few moments on the webpage. It should also allow old friends and longtime fans to more quickly identify the latest and greatest material, including blogs, news stories, videos, and articles about related organizations and people. And of course, it wouldn't be a good non-profit website if it didn't have a nice, eye-grabbing "donate" button at the top of the page (hint, hint). Let us know what you think about the new page!